Things airship related and the back story on operating the Airship Ventures Zeppelin “Eureka” in the USA. We've been spending the New Year in Europe and spent a little time checking on the progress of Zeppelin NT #4. Also in the hangar, is NT#3, undergoing her annual inspection. 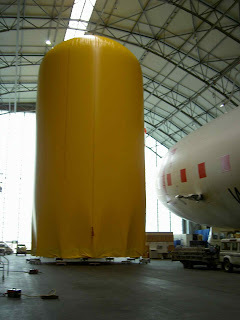 During this time, the helium is taken out of the hull and stored in vast storage bags that, to those of us who grew up in the 70's/early 80's, look exactly like the pacman ghosts! Helping the illusion are the dots that are part of the T Mobile branding on #3. Munch. Munch. Thanks for the picture, didn't know they transferred the helium like that. Our airship, “Eureka”, is the only commercial passenger airship operating in the United States! You can learn more about the various tours and charter options available, as well as our schedule, at our main site. Have you seen the airship? Send us your sighting here, and view the whole collection on our sightings blog. “Luftschiff Hoch”, or Up Ship! Welcome to our ongoing collection of airship musings. If you start from the first post, you can follow the story starting from how we got our own luftschiff off the ground, right thru our current adventures.